Car and Van Wheel & Tracking Alignment. If your tyres wear unevenly or your steering veers to one side, you may need your wheel alignment (tracking) corrected. It involves correcting the angles of your wheels so that they are accurately re-set to the its original position. Tyre Bay MCR offers alignment services on latest alignment technology in Manchester Area. 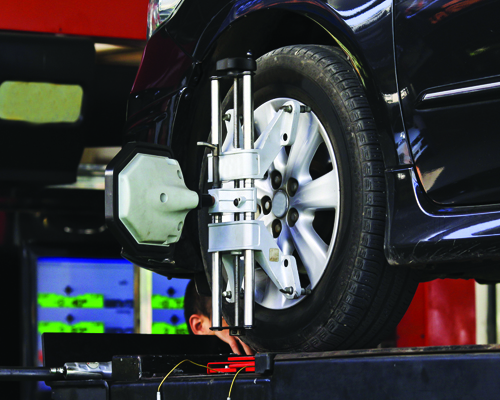 Wheel Alignment – Increase Performance of Your Tyres. The wheel alignment is a very important part of the maintenance of your vehicle. Incorrect alignment affects the handling and safety of your vehicle. The result of incorrect alignment is; extra fuel consumption, rapid wear of tyres and increased tyre rolling resistance which causes the engine to work harder. WHEN SHOULD I GET MY CAR WHEELS ALIGNED? If your tyres are wearing abnormally, alignment should be checked to find the cause. There’s a strong possibility that something needs to be readjusted or replaced. Tyre Bay MCR offers complete range of alignment services in Manchester Area. If you’re buying a new set of tyres and to maximise the tread life, as insurance, it’s a good idea to have the wheel alignment checked. Even if the alignment is within the vehicle manufacturer’s specified range, there’s always room for improvement. Assuring maximum tyre life with wheel alignment is money well spent, considering the cost of many performance tyres today. The latest wheel alignment technology is used by our specialists.